Demonstrators protesting the shooting death of an unarmed black man said to be “mentally perturbed” gathered in El Cajun for a second night of mostly peaceful protests, chanting slogans and holding signs. 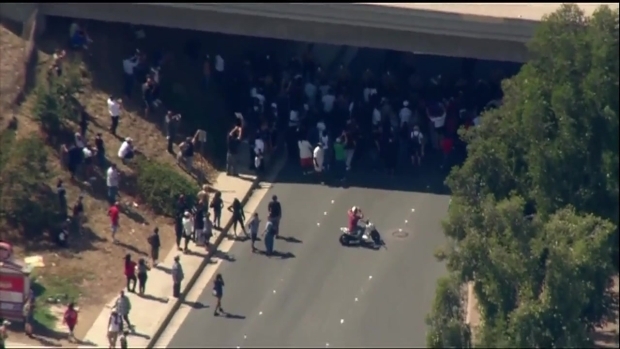 Several hundred people took to the streets of the San Diego suburb, marching from the shooting scene to City Hall and back, shouting Alfred Okwera Olango’s name, taunting police and periodically blocking traffic. 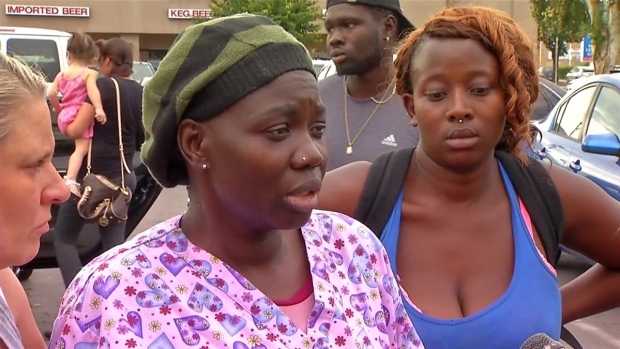 The 28-year-old refugee from the Uganda was fatally shot by police after allegedly taking a “shooting stance” while holding an object during a confrontation with officers in shopping center’s parking lot, El Cajon police said. Police later confirmed Olango was holding a vape smoking device. The crowd staged a boisterous but peaceful rally near the site of Olango’s death at the Broadway Plaza Shopping Center on Broadway, chanting “No justice, no peace,” and holding “Black Lives Matter” signs. A tense situation unfolded earlier Wednesday evening after some sort of scuffle prompted the crowd to scatter, and forced police to call in back up. Officers in riot gear could be seen forming lines and blocking off streets, but mostly kept their distance. Demonstrators milled about the streets, but the mood grew more relaxed and the crowds gradually diminished. Protests against the police shooting began earlier in the day, when crowds gathered and walked in between cars traveling in the opposite direction along Broadway. 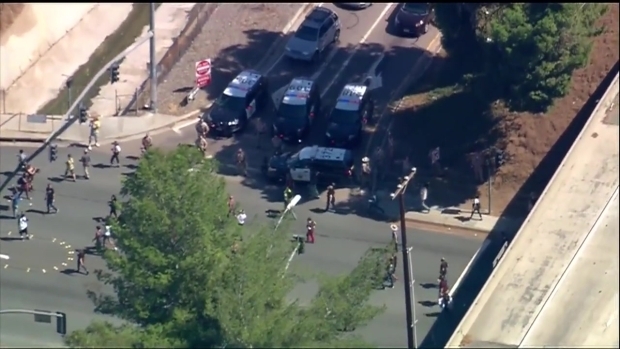 A dozen San Diego County Sheriff’s deputies stood in a line across Broadway between Ballantyne Street and Mollison Avenue, in an apparent attempt to block protesters from getting on to State Route 67. 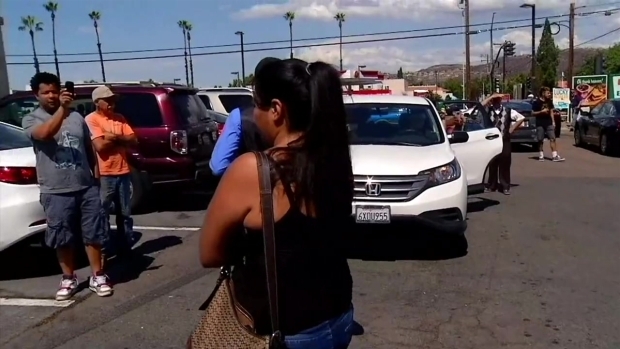 One woman, who was protesting with her son, told NBC 7 that she worries about him because he’s black and she’s white. Her son, Josiah, said he was out in the streets because he was tired of his mom worrying about him whenever he left the house. Protesters also held a candlelight memorial for Olango at the shooting scene on Broadway. They said his name multiple times and held a moment of silence before heading to the street for a sit-in. 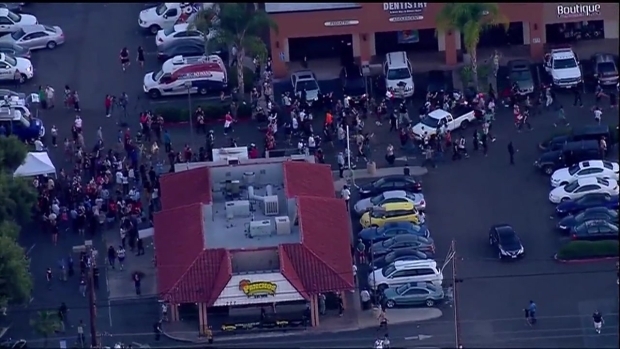 Parkway Plaza in El Cajon, on the 400 block of Fletcher Parkway off Interstate 8, temporarily closed their doors Wednesday because of the protesters. “By request of local authorities and out of an abundance of caution, Parkway Plaza will be temporarily closed due to demonstrations in the area. We will let you know when we are scheduled to reopen,” the Plaza said in a statement on their Facebook page. El Cajon Police said the mall chose to close on its own. On Tuesday, officers with the El Cajon Police Department (ECPD) shot and killed Alfred Olango, a Ugandan refugee, during an encounter in the parking lot of a shopping center in the 800 block of Broadway. Police said Olango was reported to be “acting erratically” and did not follow orders to remove his hands from the pockets of his pants. Police said at one point he pulled an object from his pants and pointed it at officers in a “shooting stance.” Authorities later revealed the object was a vaping device. The killing of Olango sparked outrage in the community amid racial tensions nationwide stemming from deadly police shootings of unarmed black men. An news crew captured one confrontation between a protester and a sheriff’s deputy. “Pigs! Be scared! [You’re all] in riot gear because you’re all f—ing cowards!” the protester said. A man wearing a shirt with the words #BlackLives tried to walk across the line formed by law enforcement but was quickly stopped by a deputy. The man shouted that he was trying to get to his son on the other side of the line. “Stop! Go back!” the deputy told the man. 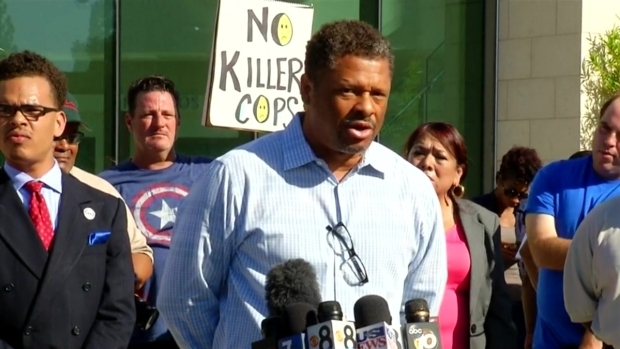 “Is not following police orders a justification for killing? This is Murder,” said Christopher Rice-Wilson, the Associate Director at Alliance San Diego who was one of the protesters. Olango emigrated to the U.S. in 1991 when he was 12 years old.